The Academy of Motion Picture Arts and Sciences recently cut the ribbon on its newest screening venue, an open-air theater at its 7.5-acre campus on Vine Street in the heart of Hollywood. As of mid-June, the site is currently hosting its inaugural ten-weekend summer film series known as “Oscars Outdoors,” which is being reinforced via an L-Acoustics P Series self-powered loudspeaker system. 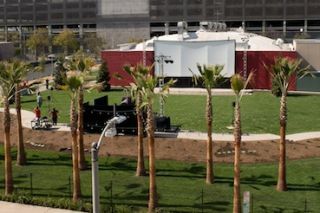 With Friday evening showings dedicated to classics and adult-contemporary favorites and Saturday nights offering family-friendly fare, the grassy new theater is a nod to the popular drive-in cinemas of the past and can accommodate up to 500 moviegoers on blankets or low lawn chairs. The theater’s full 7.1 loudspeaker setup is comprised of three coaxial L-Acoustics 112P cabinets for LCR and four smaller stand-mounted 108P systems for true surround. Low end is delivered by two SB15 subs positioned together beneath the 40x20-foot screen, which is hung on the back of what once was A-1 Audio’s Los Angeles facility years ago.